Sephardic law and customs means the practice of Judaism by the Sephardim, the descendants of the historic Jewish community of the Iberian Peninsula. Some definitions of "Sephardic" also include Mizrahi Jews, many of whom follow the same traditions of worship but have different ethno-cultural traditions. Sephardi Rite is not a denomination or movement like Orthodox, Reform, and other Ashkenazi Rite worship traditions. Sephardim thus comprise a community with distinct cultural, juridical and philosophical traditions. Sephardim are, primarily, the descendants of Jews from the Iberian peninsula. They may be divided into the families that left in the Expulsion of 1492 and those that remained in Spain as crypto-Jews, fleeing in the following few centuries. In religious parlance, and by many in modern Israel, the term is used in a broader sense to include all Jews of Ottoman or other Asian or North African backgrounds, whether or not they have any historic link to Spain, though some prefer to distinguish between Sephardim proper and Mizraḥi Jews. Both groups follow general Jewish law without those customs specific to the Ashkenazic tradition. The Spanish rite was an offshoot of the Babylonian-Arabic family of Jewish rites and retained a family resemblance to the other rites of that family. Following the expulsion the Spanish exiles took a leading role in the Jewish communities of Asia and Africa, who modified their rites to bring them still nearer to the Spanish rite, which by then was regarded as the standard. The Shulchan Aruch. One of the codes of Jewish law reflecting Sephardic laws and customs. Jewish law is based on the Torah, as interpreted and supplemented by the Talmud. The Talmud in its final form dates from the Sassanian period and was the product of a number of colleges in Babylonia. The two principal colleges, Sura and Pumbedita, survived well into the Islamic period. Their presidents, known as Geonim, together with the Exilarch, were recognised by the Abbasid Caliphs as the supreme authority over the Jews of the Arab world. The Geonim provided written answers to questions on Jewish law from round the world, which were published in collections of responsa and enjoyed high authority. The Geonim also produced handbooks such as the Halachot Pesuqot by Yehudai Gaon and the Halachot Gedolot by Simeon Kayyara. The learning of the Geonim was transmitted through the scholars of Kairouan, notably Chananel Ben Chushiel and Nissim Gaon, to Spain, where it was used by Isaac Alfasi in his Sefer ha-Halachot (code of Jewish law), which took the form of an edited and abridged Talmud. This in turn formed the basis for the Mishneh Torah of Maimonides. A feature of these early Tunisian and Spanish schools was a willingness to make use of the Jerusalem Talmud as well as the Babylonian. Developments in France and Germany were somewhat different. They too respected the rulings of the Geonim, but also had strong local customs of their own. The Tosafists did their best to explain the Talmud in a way consistent with these customs. A theory grew up that custom trumps law (see Minhag): this had some Talmudic support, but was not nearly so prominent in Arabic countries as it was in Europe. Special books on Ashkenazic custom were written, for example by Yaakov Moelin. Further instances of Ashkenazic custom were contributed by the penitential manual of Eleazar of Worms and some additional stringencies on sheḥitah (the slaughter of animals) formulated in Jacob Weil's Sefer Sheḥitot u-Bediqot. The learning of the Tosafists, but not the literature on Ashkenazic customs as such, was imported into Spain by Asher ben Yeḥiel, a German-born scholar who became chief rabbi of Toledo and the author of the Hilchot ha-Rosh - an elaborate Talmudic commentary, which became the third of the great Spanish authorities after Alfasi and Maimonides. A more popular résumé, known as the Arba'ah Turim, was written by his son, Jacob ben Asher, though he did not agree with his father on all points. Following the expulsion of the Jews from Spain, Jewish law was codified by Joseph Caro in his Bet Yosef, which took the form of a commentary on the Arba'ah Turim, and Shulḥan Aruch, which presented the same results in the form of a practical abridgement. He consulted most of the authorities available to him, but generally arrived at a practical decision by following the majority among the three great Spanish authorities, Alfasi, Maimonides and Asher ben Yeḥiel, unless most of the other authorities were against them. He did not consciously intend to exclude non-Sephardi authorities, but considered that the Ashkenazi school, so far as it had anything to contribute on general Jewish law as opposed to purely Ashkenazi custom, was adequately represented by Asher. However, since Alfasi and Maimonides generally agree, the overall result was overwhelmingly Sephardi in flavour, though in a number of cases Caro set the result of this consensus aside and ruled in favour of the Catalan school (Nahmanides and Solomon ben Adret), some of whose opinions had Ashkenazi origins. 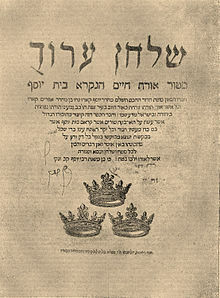 The Bet Yosef is today accepted by Sephardim as the leading authority in Jewish law, subject to minor variants drawn from the rulings of later rabbis accepted in particular communities. The Polish rabbi Moses Isserles, while acknowledging the merits of the Shulḥan Aruch, felt that it did not do justice to Ashkenazi scholarship and practice. He accordingly composed a series of glosses setting out all respects in which Ashkenazi practice differs, and the composite work is today accepted as the leading work on Ashkenazi halachah. Isserles felt free to differ from Caro on particular points of law, but in principle he accepted Caro's view that the Sephardic practice set out in the Shulḥan Aruch represents standard Jewish law while the Ashkenazi practice is essentially a local custom. So far, then, it is meaningless to speak of "Sephardic custom": all that is meant is Jewish law without the particular customs of the Ashkenazim. For this reason, the law accepted by other non-Ashkenazi communities, such as the Italian and Yemenite Jews, is basically similar to that of the Sephardim. There are of course customs peculiar to particular countries or communities within the Sephardic world, such as Syria and Morocco. An important body of customs grew up in the Kabbalistic circle of Isaac Luria and his followers in Safed, and many of these have spread to communities throughout the Sephardi world: this is discussed further in the Liturgy section below. In some cases they are accepted by Greek and Turkish Sephardim and Mizrahi Jews but not by Western communities such as the Spanish and Portuguese Jews. These are customs in the true sense: in the list of usages below they are distinguished by an L sign. For the outline and early history of the Jewish liturgy, see the articles on Siddur and Jewish services. At an early stage, a distinction was established between the Babylonian ritual and that used in Palestine, as these were the two main centres of religious authority: there is no complete text of the Palestinian rite, though some fragments have been found in the Cairo Genizah. Some scholars maintain that Ashkenazi Jews are inheritors of the religious traditions of the great Babylonian Jewish academies, and that Sephardi Jews are descendants of those who originally followed the Judaean or Galilaean Jewish religious traditions. Others, such as Zunz, maintain precisely the opposite. To put the matter into perspective it must be emphasized that all Jewish liturgies in use in the world today are in substance Babylonian, with a small number of Palestinian usages surviving the process of standardization: in a list of differences preserved from the time of the Geonim, most of the usages recorded as Palestinian are now obsolete. (In the list of usages below, Sephardic usages inherited from Palestine are marked P, and instances where the Sephardic usage conforms to the Babylonian while the Ashkenazic usage is Palestinian are marked B.) By the 12th century, as a result of the efforts of Babylonian leaders such as Yehudai Gaon and Pirqoi ben Baboi, the communities of Palestine, and Diaspora communities such as Kairouan which had historically followed Palestinian usages, had adopted Babylonian rulings in most respects, and Babylonian authority was accepted by Jews throughout the Arabic-speaking world. Early attempts at standardizing the liturgy which have been preserved include, in chronological order, those of Amram Gaon, Saadia Gaon, Shelomoh ben Natan of Sijilmasa (in Morocco) and Maimonides. All of these were based on the legal rulings of the Geonim but show a recognisable evolution towards the current Sephardi text. The liturgy in use in Visigothic Spain is likely to have belonged to a Palestinian-influenced European family, together with the Italian and Provençal, and more remotely the Old French and Ashkenazi rites, but as no liturgical materials from the Visigothic era survive we cannot know for certain. From references in later treatises such as the Sefer ha-Manhig by Rabbi Abraham ben Nathan ha-Yarḥi (c. 1204), it appears that even at that later time the Spanish rite preserved certain European peculiarities that have since been eliminated in order to conform to the rulings of the Geonim and the official texts based on them. (Conversely the surviving versions of those texts, in particular that of Amram Gaon, appear to have been edited to reflect some Spanish and other local usages.) The present Sephardic liturgy should therefore be regarded as the product of gradual convergence between the original local rite and the North African branch of the Babylonian-Arabic family, as prevailing in Geonic times in Egypt and Morocco. Following the Reconquista, the specifically Spanish liturgy was commented on by David Abudirham (c. 1340), who was concerned to ensure conformity with the rulings of halachah, as understood by the authorities up to and including Asher ben Yehiel. Despite this convergence, there were distinctions between the liturgies of different parts of the Iberian peninsula: for example the Lisbon and Catalan rites were somewhat different from the Castilian rite, which formed the basis of the later Sephardic tradition. The Catalan rite was intermediate in character between the Castilian rite and that of Provence: Haham Gaster classified the rites of Oran and Tunis in this group. After the expulsion from Spain, the Sephardim took their liturgy with them to countries throughout the Arab and Ottoman world, where they soon assumed positions of rabbinic and communal leadership. They formed their own communities, often maintaining differences based on their places of origin in the Iberian peninsula. In Salonica, for instance, there were more than twenty synagogues, each using the rite of a different locality in Spain or Portugal (as well as one Romaniot and one Ashkenazi synagogue). The Hakham Bashi of Constantinople was the constitutional head of all the Jews of the Ottoman Empire, further encouraging uniformity. The North Africans in particular were influenced by Greek and Turkish models of Jewish practice and cultural behaviour: for this reason many of them to this day pray according to a rite known as "minhag Ḥida" (the custom of Chaim Joseph David Azulai). The influence of Isaac Luria's Kabbalah, see the next section. The most important theological, as opposed to practical, motive for harmonization was the Kabbalistic teachings of Isaac Luria and Ḥayim Vital. Luria himself always maintained that it was the duty of every Jew to abide by his ancestral tradition, so that his prayers should reach the gate in Heaven appropriate to his tribal identity. However he devised a system of usages for his own followers, which were recorded by Vital in his Sha'ar ha-Kavvanot in the form of comments on the Venice edition of the Spanish and Portuguese prayer book. The theory then grew up that this composite Sephardic rite was of special spiritual potency and reached a "thirteenth gate" in Heaven for those who did not know their tribe: prayer in this form could therefore be offered in complete confidence by everyone. Further Kabbalistic embellishments were recorded in later rabbinic works such as the 18th century Ḥemdat Yamim (anonymous, but sometimes attributed to Nathan of Gaza). The most elaborate version of these is contained in the Siddur published by the 18th century Yemenite Kabbalist Shalom Sharabi for the use of the Bet El yeshivah in Jerusalem: this contains only a few lines of text on each page, the rest being filled with intricate meditations on the letter combinations in the prayers. Other scholars commented on the liturgy from both a halachic and a kabbalistic perspective, including Ḥayim Azulai and Ḥayim Palaggi. the Spanish and Portuguese Jews of Western countries, who adopted a certain number of Kabbalistic usages piecemeal in the 17th century but later abandoned them because it was felt that the Lurianic Kabbalah had contributed to the Shabbetai Tzvi disaster. There were also Kabbalistic groups in the Ashkenazic world, which adopted the Lurianic-Sephardic ritual, on the theory of the thirteenth gate mentioned above. This accounts for the "Nusach Sefard" and "Nusach Ari" in use among the Hasidim, which is based on the Lurianic-Sephardic text with some Ashkenazi variations. From the 1840s on a series of prayer-books was published in Livorno, including Tefillat ha-Ḥodesh, Bet Obed and Zechor le-Abraham. These included notes on practice and the Kabbalistic additions to the prayers, but not the meditations of Shalom Sharabi, as the books were designed for public congregational use. They quickly became standard in almost all Sephardic and Oriental communities, with any local variations being preserved only by oral tradition. In the late 19th and early 20th centuries, many more Sephardic prayer books were published in Vienna. These were primarily aimed at the Judaeo-Spanish communities of the Balkans, Greece and Turkey, and therefore had rubrics in Ladino, but also had a wider distribution. An important influence on Sephardic prayer and custom was the late 19th century Baghdadi rabbi known as the Ben Ish Ḥai, whose work of that name contained both halachic rulings and observations on Kabbalistic custom based on his correspondence with Eliyahu Mani of the Bet El yeshivah. These rulings and observations form the basis of the Baghdadi rite: both the text of the prayers and the accompanying usages differ in some respects from those of the Livorno editions. The rulings of the Ben Ish Ḥai have been accepted in several other Sephardic and Oriental communities, such as that of Jerba. In the Sephardic world today, in particular in Israel, there are many popular prayer-books containing this Baghdadi rite, and this is what is currently known as Minhag Edot ha-Mizraḥ (the custom of the Oriental congregations). Other authorities, especially older rabbis from North Africa, reject these in favour of a more conservative Oriental-Sephardic text as found in the 19th century Livorno editions; and the Shami Yemenite and Syrian rites belong to this group. Others again, following R. Ovadia Yosef, prefer a form shorn of some of the Kabbalistic additions and nearer to what would have been known to R. Joseph Caro, and seek to establish this as the standard "Israeli Sephardi" rite for use by all communities. The liturgy of the Spanish and Portuguese Jews differs from all these (more than the Eastern groups differ from each other), as it represents an older form of the text, has far fewer Kabbalistic additions and reflects some Italian influence. The differences between all these groups, however, exist at the level of detailed wording, for example the insertion or omission of a few extra passages: structurally, all Sephardic rites are very similar. They say only one blessing to cover the tefillin of the arm and the head, rather than one for each. They wind the tefillin strap anti-clockwise (for a right-handed person). The form of the knot and of the wrappings round the hand is also different from that of the Ashkenazim. Mezuzot are placed vertically rather than slanting, except among Spanish and Portuguese Jews in western countries. In the tzitzit, each winding loops through the preceding one, and the pattern of windings between the knots is either 10-5-6-5 (in some communities, L) or 7-8-11-13 (in others, per Shulḥan `Arukh). The script used in Torah scrolls, tefillin and mezuzot is different from the Ashkenazic and nearer to the printed square characters. In many of the prayers, they preserve Mishnaic patterns of vocalization and have mostly not altered them to conform with the rules of Biblical Hebrew: examples are "Naqdishakh" (not "Naqdishkha") and "ha-Gefen" (not "ha-Gafen"). The second blessing before the Shema begins "Ahavat `Olam" (and not "Ahavah Rabbah") in all services. The Qedushah of the morning service begins "Naqdishakh ve-Na`ariṣakh", and the Qedushah of musaf (the additional service for Shabbat and festivals) begins "Keter Yitenu L'kha". There are separate summer and winter forms for the "Birkat ha-Shanim". The last blessing of the `Amidah is "Sim Shalom" (and not "Shalom Rav") in all services. They are permitted to sit for Qaddish. Adon Olam has an extra stanza (and is longer still in Oriental communities). In many communities (mostly Mizrahi rather than Sephardi proper) the Torah scroll is kept in a tiq (wooden or metal case) instead of a velvet mantle. Most Sephardim regard it as permissible to eat rice or beans on Passover. Sephardim only say blessings over the first and third cups of Passover wine, instead of over all four. Seliḥot are said throughout the month of Elul. Sephardic Rishonim (medieval scholars) reject the customs of Tashlikh and Kapparot, though they were re-introduced by the Lurianic school (Spanish and Portuguese Jews still do not observe them). Only one set of Hanukkah lights is lit in each household. The shammash is lit together with the other Hanukkah lights, instead of being used to light them (which would be impractical, given that the lights are traditionally oil lamps rather than candles). The laws of sheḥitah are in some respects stricter and in other respects less strict than those of Ashkenazim (modern kashrut authorities try to ensure that all meat complies with both standards). Many Sephardim avoid eating fish with milk, as in Eastern Mediterranean countries this is widely considered to be unhealthy (by non-Jews as well as Jews). Ashkenazim argue that this practice originated from a mistake in the Bet Yosef, and that the prohibition really concerned the eating of fish with meat. Dayan Toledano, Pinchas, Fountain of Blessings, a Code of Jewish Law, mekor bracha: London 1989, Jerusalem 2009 (edited and expanded to 4 volumes). See List of Sephardic prayer books. R. Chouraqui. "The Leadership and Traditions of the Sephardi Sages in the Modern Era." Conversations 1.7 (2010): n. pag. Web. <http://www.jewishideas.org/articles/leadership-and-traditions-sephardi-sages-modern-era>. Mauroof, Joshua, Rabbi. "Sephardic Tradition - The Judaism of the Future." University of Maryland. 28 Mar. 2013. Lecture. <https://www.youtube.com/watch?v=WG10ZhFN4tM>. ^ Ezra Fleischer, Eretz-Yisrael Prayer and Prayer Rituals as Portrayed in the Geniza Documents (Hebrew), Jerusalem 1988. There is an attempted reconstruction of the Eretz Yisrael rite by David Bar-Hayim of the Machon Shilo. ^ Moses Gaster, preface to the Book of Prayer of the Spanish and Portuguese Jews' Congregation, London, 1901: reprinted in 1965 and subsequent editions. ^ Lewin, B. M., Otzar Ḥilluf Minhagim. ^ See Iggeret Pirkoi ben Bavoi, Ginzberg, Geonica pp. 48-53; idem, Ginze Schechter, pp. 544-573; Lewin, Tarbiz vol. 2 pp. 383-405; Mann, R.E.J. vol. 20 pp. 113-148. It is reprinted in Toratan shel Geonim. ^ S. Zucker and E. Wust, "The oriental origin of 'Siddur R. Shlomo b. R. Natan' and its erroneous ascription to North Africa" Kiryat Sefer 64 (1992-3) pp 737-46, argue that this prayer book in fact originated in western Iran. This theory is rejected by S. Reif, Problems with Prayers p. 348. See also U. Ehrlich, "The Contribution of Genizah Texts to the Study of Siddur Rabbi Solomon ben Nathan", in B. Outhwaite and S. Bhayro (eds) From a Sacred Source: Genizah Studies in Honour of Professor Stefan C. Reif (Leiden 2011) pp 134-5. ^ For both points, see Louis Ginzberg, Geonica. ^ Preface to the Book of Prayer of the Spanish and Portuguese Jews' Congregation, London, above. ^ Michael Molho, Usos y costumbres de los judíos de Salonica. ^ "There are many differences between the [various] prayer books, between the Sefardi rite, the Catalonian rite, the Ashkenazi rite, and the like. Concerning this matter, my master [the Ari] of blessed memory told me that there are twelve windows in heaven corresponding to the twelve tribes, and that the prayer of each tribe ascends through its own special gate. This is the secret of the twelve gates mentioned at the end of [the book of] Yechezkel. There is no question that were the prayers of all the tribes the same, there would be no need for twelve windows and gates, each gate having a path of its own. Rather, without a doubt it necessarily follows that because their prayers are different, each and every tribe requires its own gate. For in accordance with the source and root of the souls of that tribe, so must be its prayer rite. It is therefore fitting that each and every individual should maintain the customary liturgical rite of his forefathers. For you do not know who is from this tribe and who from that tribe. And since his forefathers practiced a certain custom, perhaps he is from that tribe for whom this custom is appropriate, and if he comes now and changes it, his prayer may not ascend [to heaven], when it is not offered in accordance with that rite. (Sha'ar ha-Kavvanot, 'Inyan Nusach ha-Tefillah)" Navon, Chaim (Rav); Strauss, translated by David. "The various rites of Jewish liturgy". The Israel Koschitzky Virtual Beit Midrash. Yeshivat Har Etzion. Retrieved 9 March 2015. ^ It should be noted that many of the usages attributed to Isaac Luria were not his inventions, but older minority views on Jewish practice, which he revived and justified on Kabbalistic grounds. Some were adopted from the Ḥaside Ashkenaz or the Ashkenazi rite. ^ Shelomo Tal, Nosaḥ ha-Tefillah shel Yehude Paras. ^ The diagnostic usage of the Yosef group is the saying of the blessing over the Shabbat candles before instead of after lighting them, in accordance with the Shulchan Aruch; see Azuz, "Kabbala and Halacha". ^ See Yitzhak, Hertzel Hillel, Tzel HeHarim: Tzitzit: New York, Feldheim Publishers 2006 ISBN 1-58330-292-1. ^ This script is called "Velsh" or "Veilish", and comes from Italy. The name is the Yiddish equivalent of German wälsch meaning "foreign" (or more specifically "Romance" or "Italian", cf. ancient Germanic Walhaz and the use of Hebrew "lo'ez"). For some reason the Shulḥan `Arukh sets out the traditional Ashkenazic script instead. A third script, associated with Isaac Luria, is used by Hasidim. ^ This was also the case in Ashkenazi communities until the Renaissance, when scholars such as Shabbetai Sofer published prayer books with the text deliberately altered to meet the standard of Biblical Hebrew as set by the Masoretes. ^ Except in those communities where (for Kabbalistic reasons) it is not used at all. ^ Some Mizraḥi communities do not lift it at all, as the tiq is held open while scroll is carried to and from the Hekhal (or 'Aron'). ^ Moses Isserles, Darkhe Mosheh, Yoreh De'ah 87; David HaLevi Segal, Ture Zahav on same passage. This page was last edited on 20 September 2018, at 02:40 (UTC).